Good morning, friends. Today’s draw is Nott, The Star. She guides the way out of the darkness. Take heart, my dears. With the charms falling the way they do here and the rune Ear signifying transitions and passages into and out of darkness, we are guided to have faith. Where is your heart? 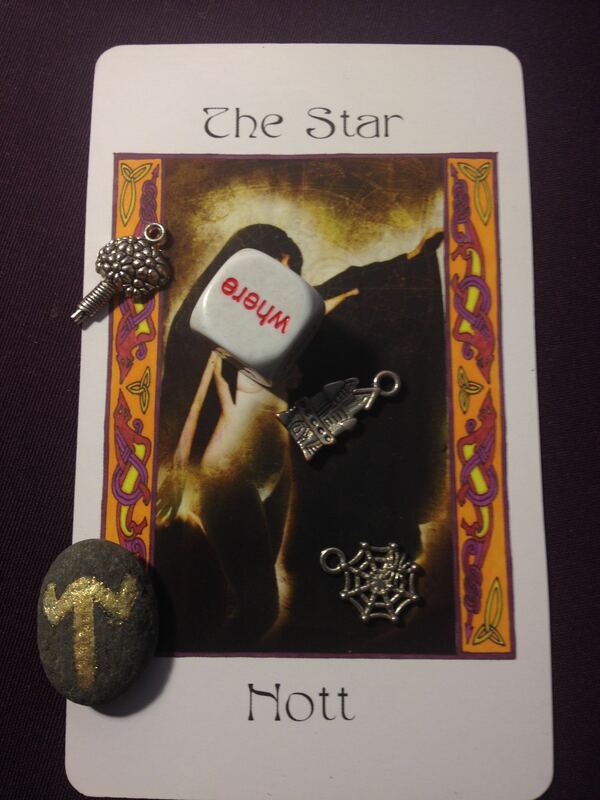 The Home charm falling right next to the Quest Die set at “Where?” which has fallen right on Nott’s heart leads us to ask if home is truly where the heart is. What do you love more than anything else? How can you make your home more inviting? You are in process, in transition. The web is being woven around you. Make your world beautiful today.Give yourself gifts of beauty. Anything to help you hang on through the dark.